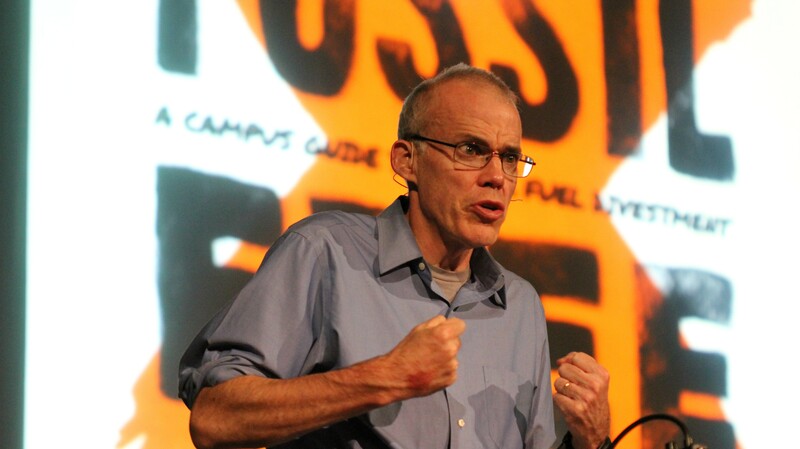 Environmental activist Bill McKibben was pleasantly surprised two weeks ago when Gov. Peter Shumlin appeared to change his tune on whether the state's retirement funds should invest in coal, oil and gas companies. Though the governor had previously resisted entreaties to divest the $4 billion pension funds of carbon-heavy assets, he appeared to embrace the notion in an interview with journalist David Goodman on WDEV's "The Vermont Conversation." "It's going to take some time to make the transformation, but I think it's a good idea," Shumlin said on the radio program, which is paid for by Vermont Businesses for Social Responsibility. But less than a week later, the governor retreated to his previous position when asked about his evolution during a gubernatorial debate on Vermont Public Radio. "There's been a discussion in Vermont about divestiture, and what I have said, in concert with [state Treasurer] Beth Pearce, is that we believe that having a seat at the table — owning the stocks and having a seat at the table with the oil companies — is a good place to be," Shumlin said, adding that he was "willing to look at any suggestions" to combat climate change. "So what I said about divestiture is I'm willing to take a look at it. I didn't say I would call for it," the governor clarified. "Because I think we should look at everything that we can do to advance the ball more quickly. I don't think that's the sharpest knife of all the things that we could do, but I certainly am always willing to look at it." McKibben, a Middlebury College scholar-in-residence and founder of 350.org, didn't think much of the governor's explanation. "I think it's sad," he said. "As you point out in [last week's Fair Game], he's been 'taking a look at it' for a year. After that, he told David Goodman 'It's going to take some time to make the transformation, but I think it's a good idea.' This is not the same as 'taking a look at it.'" McKibben, who led hundreds of thousands of activists at the People's Climate March eight days ago, said, "People are very tired of slippery politicians — and a couple of thousand Vermonters who went all the way to New York to join in the largest political gathering about anything in some years will, I think, hold him accountable to his statements." According to McKibben, "it's fine to take some time" to sell off coal, oil and gas stocks. "Our campaign all along has said that schools, churches, states should all take up to five years to actually divest, to avoid having to sell at the wrong moment and lose money," he said. "It's the announcement of intention we need now, and there's no reason [Shumlin] and Treasurer Pearce shouldn't give it immediately." "As I said," he continued, "slipperiness is unbecoming in a politician. Familiar, but unbecoming." Provided with a copy of McKibben's assessment last week, Shumlin's office did not respond. Reached last week, Pearce defended her own opposition to divestment, arguing that the state could do more to reduce carbon emissions through what she calls "constructive engagement." Working with the Boston-based, sustainable investment advisory group Ceres, Vermont's pension funds have used their proxy power to encourage energy companies to adopt more environmentally conscious practices, she said. "When you give up your seat at the table, you don't have access to that strategy," Pearce argued. Vermont's $4 billion pension funds include nearly $110 million worth of investments in energy stocks — excluding utilities and commingled investments — Pearce's office said. According to a 2013 analysis conducted by NEPC, a Boston-based investment consulting firm, divestment would cost Vermont $1.9 million in one-time transaction fees and then $8.8 million a year in increased management fees and reduced returns. Given Vermont's small size, Pearce argued, divestment wouldn't do much. "I don't think we would see a measurable impact. Folks from [350.org] have talked about the symbolism and stigmatization of companies, but I think you can get that same thing through internal pressure," she said. "I don't think divestment is a workable strategy to get us where we want to be."